Islander wishes that her girlfriends around the globe live closer so she can get together with them more often. 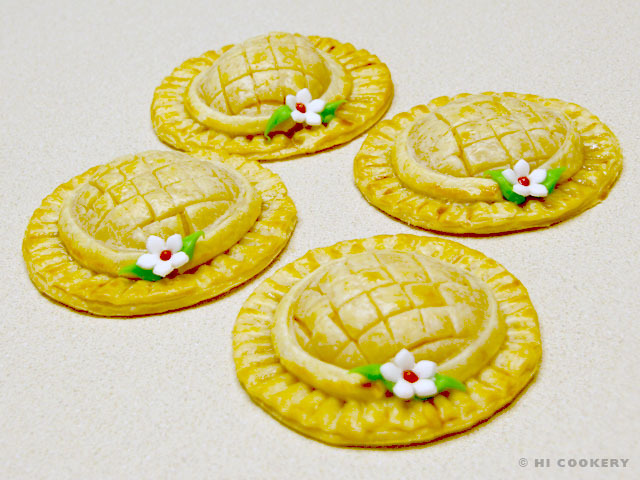 Then she would host tea time for everyone on the back patio of her home and serve savory snacks and dainty desserts, such as petite peach pies that look like summery straw hats. But her guy friends are always welcome to join her and her hubby, Highlander, too. Then tea time would become a tasting party with small plates (appetizers as a meal) and tiny treats! When an occasion calls for cute cuisine, or when it is National Peach Pie Day, try baking a batch of peach pie hats. Drain the canned peaches. Dry with paper towel. In each cavity, sprinkle ½ teaspoon of brown sugar and ¼ teaspoon of ground cinnamon. Press a pat of butter onto the filling and pack it down gently. Set aside. Roll out sheets of packaged pie dough on a lightly floured surface. On one sheet, cut four 4 ½-inch circles. On the other sheet, cut four 5-inch circles. 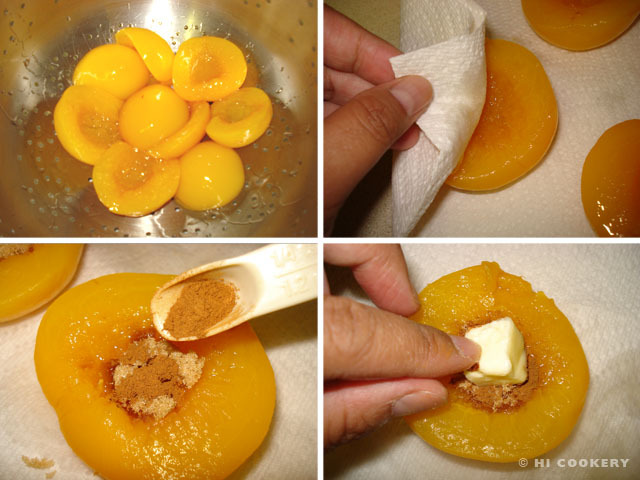 On a 4 ½-inch circle, carefully invert a filled peach in the middle. 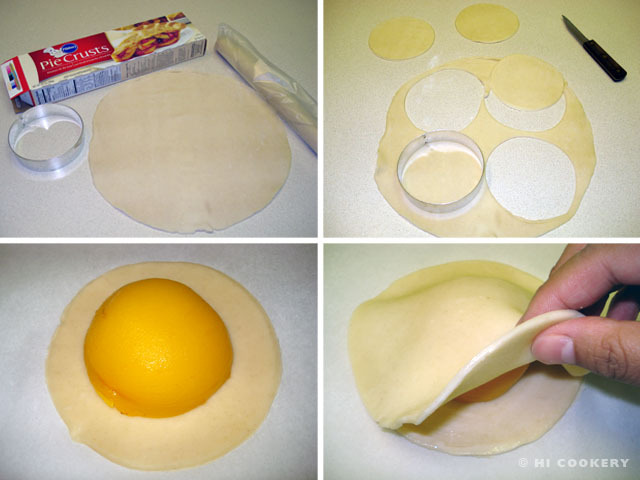 Use a 5-inch circle to cover it and seal the edges with a little water. Mold gently on the top mound to show the shape of the peach. Press down on any creases. With the end of a chopstick, press ridges to seal the dough. Use a sharp paring knife to cut the top mound in criss-cross lines to create textures and vents. Re-roll and flatten out the pie dough scraps and cut into ½-inch strips. Position a strip on the hat to make a band around it. Cut the strip where it overlaps. 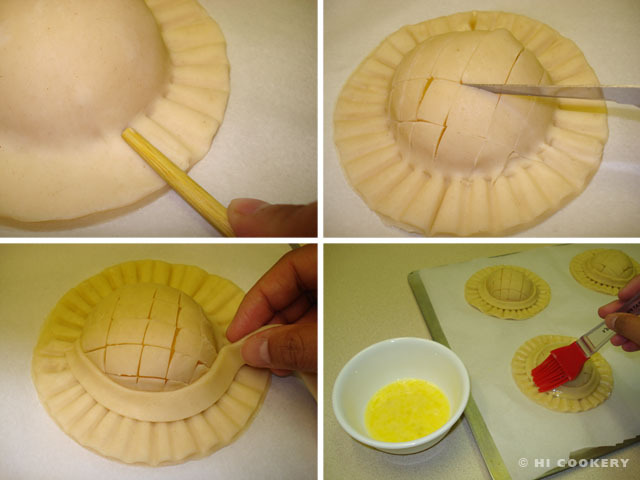 Lightly beat the egg with water to make an egg wash. Brush on the peach pie hats. Bake in a preheated oven at 425 degrees F for 10-12 minutes. Remove from the oven and cool on wire racks. Where the band strip overlaps and is cut, place a fondant flower secured with a little icing. Pipe in leaves with the green tube frosting to complete the peach pie hats. Sprinkle a little granulated sugar after brushing on the egg wash to give the peach pie hats a sparkly texture and sweeetness. Bake as directed, watching the oven to ensure that the pies do not over brown and burn. Try another petite pie recipe! 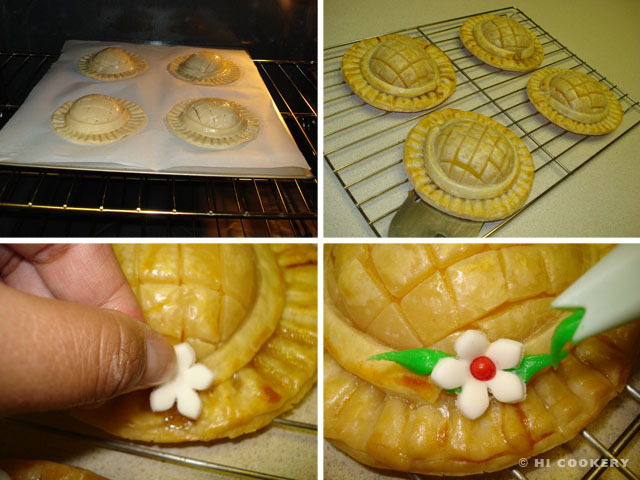 Make cherry pie pockets for National Cherry Pie Day on February 20. For a fondant flower basic tutorial, check out our cherry blossom cake and chocolate cupcake posts. Search our blog for other tea time, peach and/or pie recipes. How cute are those!! But a bit labor intensive for my lazy baking! Can you buy fondant flowers premade? You can actually find royal icing flowers in different colors and types at cake shops or the cake decorating aisle at Hobby Lobby, Michael’s and JoAnns. Sometimes Walmart sells them, too. Tea Time magazine used little edible flowers as well. I just used fondant flowers that I had made earlier and saved in my fridge.